Government finances recorded a £9.4bn in surplus in January, £0.3bn higher than the same month last year. Boosted by self-assessment tax receipts, January is typically a strong month for government finances. For the financial year-to-date, borrowing stands at £49.3bn, the lowest since the comparable period of 2008. Economists say strong tax receipts mean the government could undershoot the forecast deficit of £68bn for the current financial year. The forecast was made by the Office for Budget Responsibility (OBR) in November's Autumn Statement, although this estimate marked a sharp revision from the previous prediction of £55.5bn. Philip Hammond presents his Budget on 8 March, and the chancellor will base his budget calculations on updated figures on growth and borrowing supplied by the OBR. In a statement, a Treasury spokesperson said: "We remain committed to returning the public finances to balance and building on our progress in reducing the deficit from 10% to 4% of GDP over the last six years." Earlier this month, the EY Item Club economic think tank said that estimated borrowing for the 2016-17 financial year could be revised down to £65bn from the £68bn forecast made in the Autumn Statement. 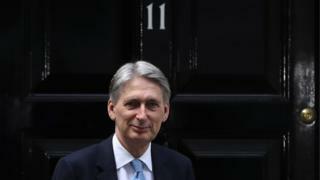 "The OBR is likely to deliver some rare good news to the chancellor by revising down its forecast for public sector net borrowing in the current fiscal year," the EY Item Club said in its Budget preview. "Unusually, tax revenues have been performing better than expected in recent months," it said. Other forecasters are even more optimistic about the outlook for UK finances. John Hawksworth, chief economist at PwC, thinks that borrowing for the financial year could be less than £60bn. As a result, the chancellor might have some room for extra spending in the Budget. "Overall, the public finances now look in rather better shape than they did three months ago, and more in line with other data showing a relatively robust UK economy in the period since the Brexit vote. "This should give the chancellor a bit more room in his Budget on 8th March to find extra money for priorities like the NHS and social care, and possibly also to alleviate the increase in business rates for the biggest losers from the coming revaluation in April." Philip Hammond is not a man known for political surprises. Spreadsheet Phil, as he probably doesn't like to be called, prefers to keep any rabbits that might be hopping around Whitehall stuffed deep in the Treasury's public spending hat. So, anyone thinking that today's better news on the state of government's finances will lead to any Budget largesse is likely to be disappointed. Those close to him are making clear, there may be some minor tweaks but there will not be major changes of direction on Budget day on 8 March. Brexit is still, in the Treasury's mind, a risk to the economy that looms large and any buffers built up now are likely to be kept back for future rainy days - if they come - rather than be spent now.